Think you can’t compete with Amazon? Competing with Amazon is possible. I’m not saying you can topple the ecommerce giant from her throne, but you can certainly rank for keywords, sell awesome stuff, and not get absolutely destroyed by them. I want to tell you how to do that in five kinda-sorta-easy steps. First, let’s talk about what you can’t do. Admitting your shortcomings is the first step to maximizing your strengths. You can’t have the same size of inventory. Amazon pretty much owns every consumer product in the world, so yeah good luck with that. You’re going to need some bigger barns to store the stuff. You can’t have Jeff Bezos. Not unless you have a really good offer for him. You can’t have the domain amazon.com. It’s already been taken, and is not for sale. I checked for you. That’s what you can’t do. And, hey, the list is only three items long. That leaves you with a ton of options for what you can do. I’m going to provide a five-step guide to doing battle with the giant. Amazon’s weakness is in its greatness. It has everything for sale. Amazon can’t be good at everything. You will have a much harder time trying to rank for a lot of different keywords, even if they are all sort of in the same niche. Whatever you sell, Amazon probably has a few more variations, sizes, colors, and features. It’s extremely important to narrow your ecommerce niche and dominate it. How do you dominate it? Through content marketing, of course. Amazon.com doesn’t do content marketing. They buy PPC, they do conversion optimization, they do SEO, they release products, they claim more verticals, and they do a lot of other things. But they don’t do content marketing very well at all. They don’t even do email marketing that great! This leaves you with a huge opportunity to go into your niche, content market the heck out of it, and start to rank for all kinds of awesome keywords. 2. Do something radical with shipping. One area that Amazon has completely dominated is the area of shipping. It is, in fact, one of the company’s greatest successes. Members of Amazon’s Prime service can get two-day shipping for free, and next-day shipping for just a few dollars on each order. And same-day shipping? Yep, they offer that, too. Can you compete with that? Yes. A company doesn’t win merely by offering something. They win by giving it without being asked. Take Zappos, for instance. They didn’t make a big deal about their killer shipping policy, but when it happened, customers were floored. And hooked. Zappos scored by delivering the customer’s packages before they anticipated them, successfully delivering, well, happiness, as CEO Tony Hsieh explained in his book. You don’t have to offer free shipping or some other extraordinary same-day service, but you can create a shipping service that exceeds expectations and provides satisfaction. 3. Create a subscription service. The subscription service is one of the smartest ways to sell a product. You don’t just get a one-and-done transactional experience with your customer. Instead, you get a relationship, and revenue every month or year. You don’t have to be a software provider to make the subscription model work. Any form of recurring deliverables warrants recurring payments. 4. Boast the best customer service experience on the planet. I mean no disrespect to Amazon, but they can’t do customer service the way you can. They’re too big. This is a sandbox that Amazon can’t play in. But you can. One of the best ways to compete with Amazon is to provide something that they can’t. They can’t provide personalized, one-on-one service to human beings like you can. But what about your business. Customer service is the idea that you have personal interaction with and relationships with your customers. Don’t complicated customer service. All you need to do is provide personal care, and be nice about it. You can solve their problems, as in this diagram from rdioutsourcing.com. There is consensus around the fact that customer retention via customer service and relationships has a better ROI and cost-effectiveness than other methods of marketing. Check out the first bar in this survey graph from eConsultancy. Superoffice.com dug into the reasons that customers leave a company, and settled on these reasons. 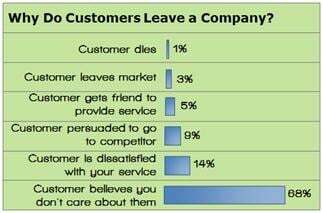 If your customer knows you care, then you can hang on to 68% of your customers. This is the single most important step in the entire process. Overdelivering to your customer can powerfully reshape your identity as a brand, and compel your customers to stay with you, rather than go to the Amazon dark side. 5. Build a fanatical fan base. My final point is linked to the point above. The warm-hug experience of great customer service leads to building a fanatical fan base. Building a jumping, screaming, raving, fanatical fan base is not easy, but it is possible. The strategy is to stay small, at least as it pertains to customer interaction. Everything you do as a brand — from social media outreach to content marketing efforts — must have this personal and close-connected feel to it. It’s about cohesion, connection, and knock-out service. Let me give you an example. You can buy a GoPro camera from Amazon, no problem. But can you connect with GoPro as a brand? Do you have the same sense, feel, connectedness and emotion? Absolutely not. That’s why true GoPro fans are going to stick to the GoPro site to buy their GoPro swag. They love this brand. GoPro has defined their niche (that’s step one), and refined their customer service. Now, they have a peerless fan base. Why is it that GoPro has 3.5 million followers on Instagram, and Amazon.com has only 95,000? I think it’s funny, too, but for different reasons. I think it’s funny because you can stick it to Amazon by outdoing them at their own game. You can succeed, not just based on your product, but on the way you market that product. A lot of that is plain kickass service. Tell me how you compete with Amazon.